An elegantly quirky goldmine of a record crossed my desk recently. 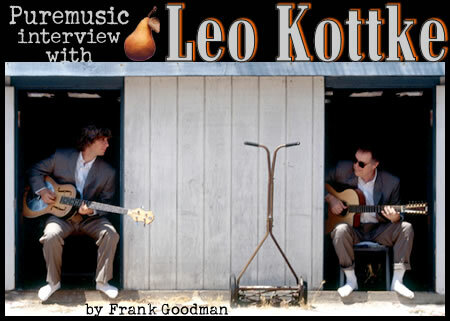 The personnel caught my eye, since it was the legendary acoustic guitar slinger Leo Kottke paired with the prodigious bassist from Phish, Mike Gordon. I figured it would be at least interesting, but it sailed far and high beyond my measured expectations. Clone is a disc of mutual admiration and musical fraternity that translates as a funky and lyrical experience. Musically speaking, it is a compositional gem, and showcases quite a few beautiful works, most composed for the occasion. But even beyond that, it demonstrates an iconoclastic duet of acoustic guitar and bass that bears special mention. The last time I heard a guitar and bass relationship that I found this interesting and exciting was the classic debut recording of Hot Tuna, where the symbiosis of Kaukonen and Cassady blew the minds of fingerpickers everywhere. Clone has a spirit of lighthearted camaraderie, but the musicianship runs deep. There is subtly virtuosic playing throughout. In the 30 years he's been recording, Leo has cut or appeared on more than that number of records. His own number an impressive 25. That's a lot of great guitar music. And I daresay this latest project with Mike Gordon will attract legions of new fans, as the duo will play a dozen shows supporting this release (dates are posted at leokottke.com). If you've heard of him forever, but haven't heard him lately, please be sure to sample some clips on the Listen page.